The Sandy River near Troutdale, Oregon was low and clear as I hiked into one of my favorite steelhead runs, located in a narrow canyon on the upper river. The widest part was only 40 to 50 feet across, and when it was clear I could stand atop large boulders and scan the water for fish. I was on one such rock when I spotted 5 to 6 male steelhead hovering around a female. She was preparing a nest and no doubt the males were competing for her charms. In this mode, fish are very protective and will defend their territory at all costs. I decided to test their patience and quickly cast a #4 Polar Shrimp about 10 feet from them. One moved to ward off the intruder but he didn’t strike. About that time two spin fishermen saw me and stopped to observe my technique. “Having any luck?” one asked. “Not yet,” I answered. 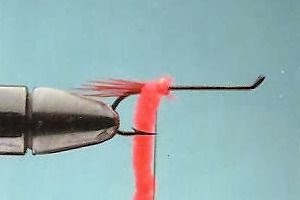 “But, I’m casting to some fish right now.” As they moved in closer the other one asked, “Do you ever catch fish with that rod of yours?” I made another cast and with my eyes focused on the fish I said, “Well, yeah. 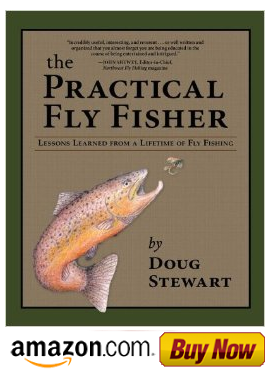 If you learn how to…Fish on!” yelled. After several strong runs and a few spectacular jumps the fish tired and I landed a chrome eight pounder. After I released it they began to quiz me on the equipment and the technique that I was using as well as where they could purchase their equipment. Several days later they came into my shop and purchased two outfits. Sometimes a picture is worth a thousand words. Step 1. 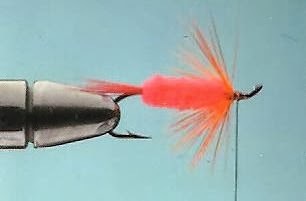 Tie in 10-15 hackle fibers and the chenille. Step 2. Wrap the chenille up and tie off. 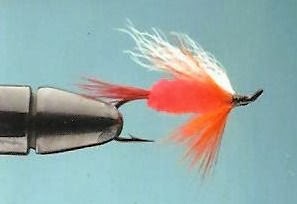 Attach the front wet fly hackle. Step 4. 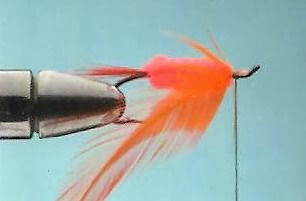 Tie in the wing and complete the fly with a neatly tapered head.